Having decided on a theme for the army I headed to the store to get some advice on colour schemes. After first trying to fob me off with the standard black armour (I guess it is best to eliminate that as an option, first) I told the chap I was after something in brown/green. Earthy, and a bit foul (Have you ever peered in to a festival toilet?). That was just for the armour. 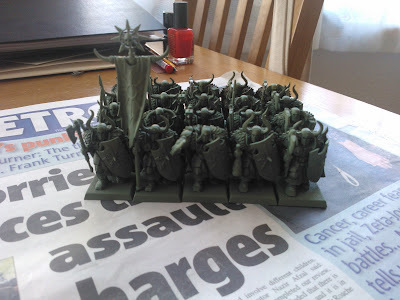 Step 3: Be guilt tripped by internet strangers in to trying to finish painting an army. Boltgun Metal for the various weapon blades, the occasional metal spike and the shield designs. 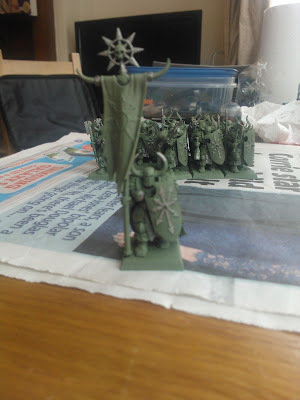 I intended to use the Warriors in units of 19 (with two leftover) and decided it would make sense to paint them up a unit at a time. 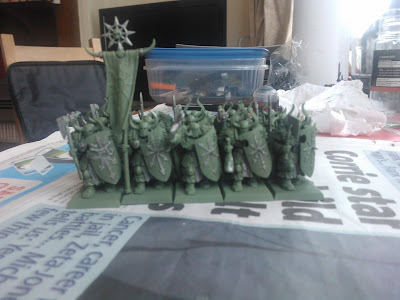 But when you lay out a unit for WHFB knowing you need to paint them it can be pretty intimidating, which is part of why I'd put it off for so long. So I needed to look at the unit as a series of smaller chunks. Just try to cover 5 models at a time and only think about one element. 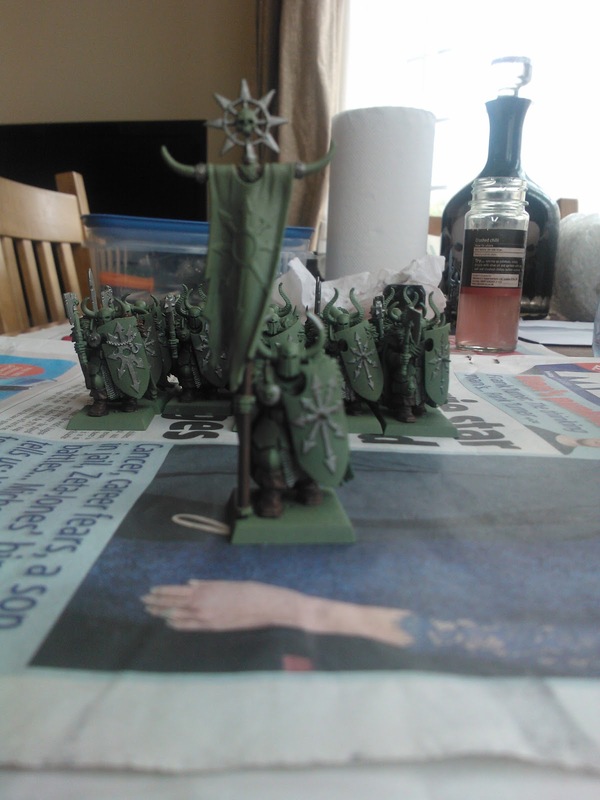 After painting the metallic parts on the first 5 models (shield designs and weapon blades) I took a break. After half an hour or so I came back and did the metallic parts of the next 5, then took a break. Same again for the last two lots of 5 models. Total painting time worked out at around 20 minutes, spread out over a spectacularly inefficient 2 hours. Instead of looking at the painting as something I needed to sit down and crack on with, I made it something I would pop back to a couple of times through the day and just do a little bit of each time. Something to occupy the few minutes while the kettle boiled. Rather than worrying I had so much to do, I managed to actually get something done.